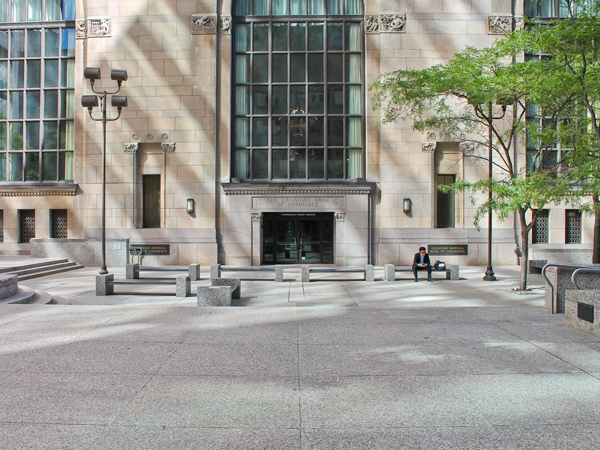 Enclosed on all sides by the Toronto Financial District’s most iconic skyscrapers, this 50 x 50 meter plaza was developed in 1972 by I.M. 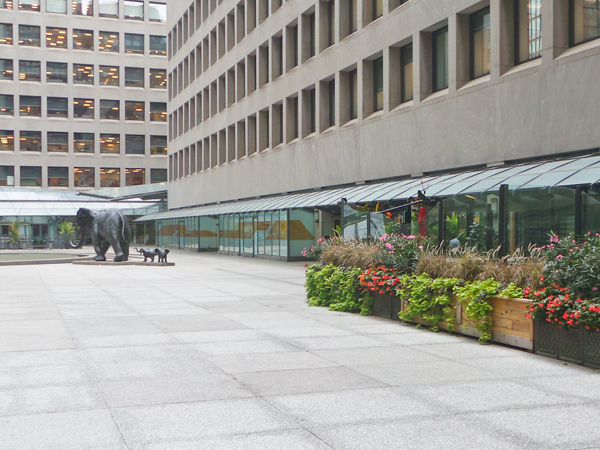 Pei & Partners to serve as the forecourt to the four structures surrounding it, also named Commerce Court. Situated in an area that was originally surrounded by woods and home to one of Toronto’s earliest churches and a theater , by the mid-nineteenth century the block-long stretch of King Street West between Bay and Yonge Streets was known as “bankers’ row.” In 1887 the Canadian Bank of Commerce established their headquarters there and, in 1931, architects Frank Darling and John Pearson completed their 34-story limestone Art Deco tower, the tallest building in the British Commonwealth until 1962. 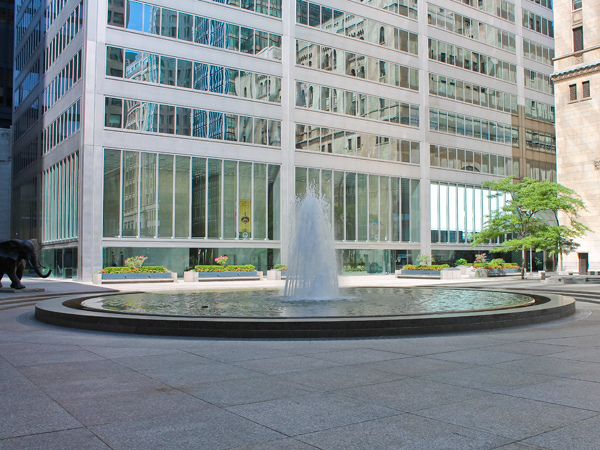 In 1972, Darling and Pearson’s structure was complemented by three additional buildings oriented around a fountain court, all designed by I.M. Pei & Partners. 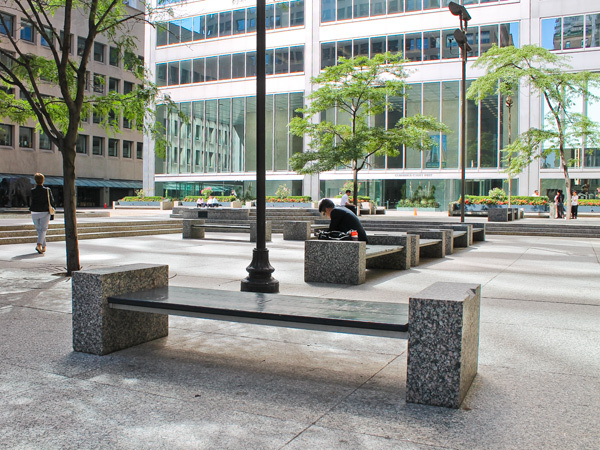 At 57 stories, the tallest of the three buildings is supported on pillars, thus connecting it to the plaza, which provides civic space and access to outdoor cafes. 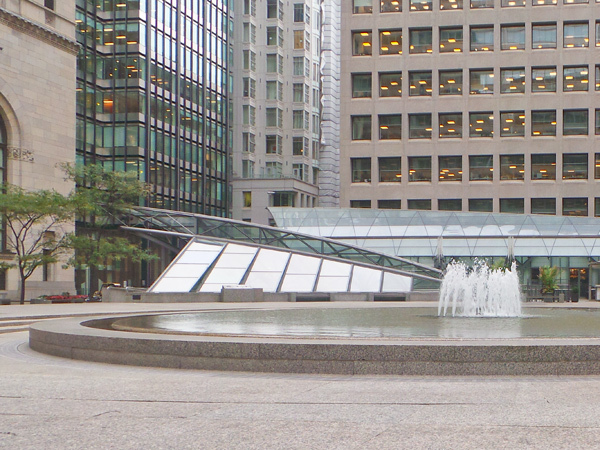 The plaza, primarily paved with textured concrete, comprises a 19.5-meter-diameter pool with jetted fountains, curvilinear and rectilinear sets of stepped risers, and backless benches. A few mature honey locusts and planting boxes with annuals provide vegetative respite from the otherwise paved plaza. 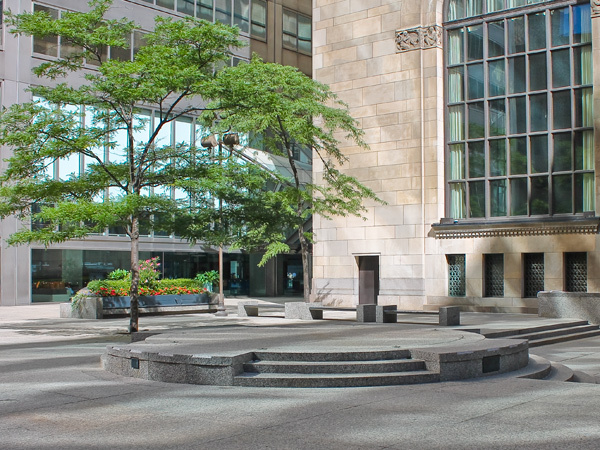 In 1994, Zeidler Partnership Architects provided renovations to the plaza and added glass and steel canopies, providing access to a belowground pedestrian tunnel. 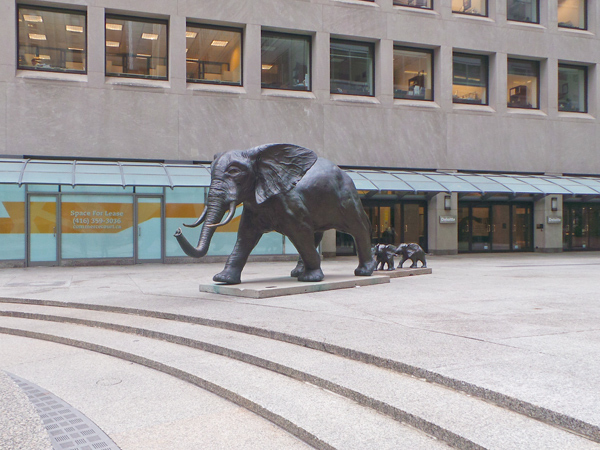 In 2005 Derrick Stephan Hudson’s bronze sculpture Tembo, Mother of Elephants, was installed southwest of the pool.